Theresa May has been applauded by Tory MPs after making a "heartfelt" appeal for unity over Brexit and urging her critics to get behind her. The prime minister has been addressing all her MPs in Parliament, many of whom are seeking a change of approach. Asked by one MP what concessions she had made to the EU, she set out areas where the EU had itself given ground. Former minister Amber Rudd said the PM "won the room" while another MP said it was a "petting zoo, not a lion's den". The sound of desks and doors being thumped could be heard coming from the Commons room where the 1922 committee - an elected body of MPs which represents backbenchers and also oversees leadership contests - met privately. Comments by unnamed Tory MPs over the weekend suggested the PM would be fighting for her political life at the meeting and was on the edge of the "killing zone". However, Tory MP Michael Fabricant told journalists waiting outside that the atmosphere inside the meeting was "not a lion's den but a petting zoo". Attorney General Geoffrey Cox said the PM's remarks were "very good" while former home secretary Amber Rudd said Mrs May "was able to win the room, despite being frank about difficulties still there". "She looked like she really meant it," she told the BBC. "It felt heartfelt." And Basildon MP John Baron said "the mood was, let's get behind the PM and get this over the line". But not all MPs were happy, one suggesting the odds of her surviving another week were 50:50 while another said what mattered was the mood in the party not orchestrated shows of support. Mrs May is reported to have told MPs that she had won a number of concessions from the EU, including the role of the European Court of Justice in enforcing the rights of EU citizens in the UK. She also rejected suggestions that her top European adviser, Olly Robbins, was "freelancing" when the UK agreed to consider extending the post-Brexit transition period beyond 2020. Talks on the UK's exit from the EU are said to be 95% complete, but have stalled over the Irish border issue. 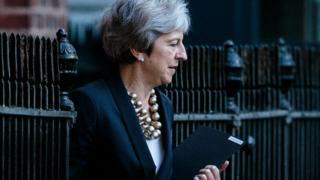 The UK prime minister has said that having the option of extending the transition could provide the "safety net" or "backstop" needed to guarantee no new visible border checks where Northern Ireland meets the Republic. But her plans have come in for criticism among Tory ranks, with a social media campaign called "Standup4Brexit" claiming to have 50 MPs backing its call for Mrs May to "chuck" her current strategy. The prime minister has said any temporary measure used to avoid a hard border would have to end by the next general election, which is due in 2022. At the weekend, anonymous quotes about Mrs May in the Sunday newspapers sparked a backlash from MPs of all parties. The Sunday Times quoted a Tory backbencher saying: "The moment is coming when the knife gets heated, stuck in her front and twisted. She'll be dead soon." Another said she should "bring her own noose" to the 1922 Committee meeting. Tory MPs said those behind the quotes were "spineless cowards" who should be thrown out of the party. 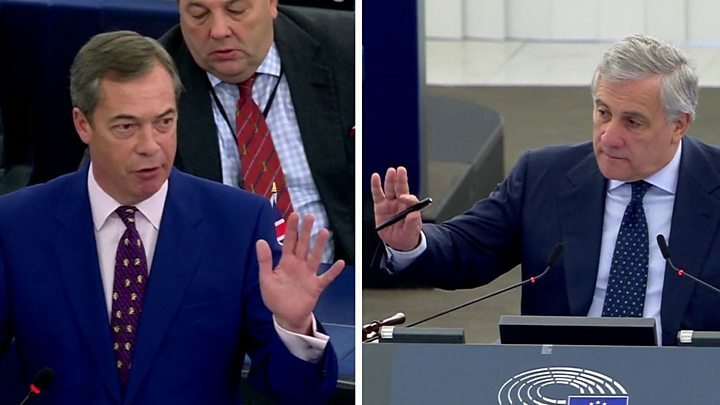 Meanwhile, EU politicians in Strasbourg have been debating Brexit, with European Council President Donald Tusk saying more time was needed to find a solution. "Therefore, there is no other way but to continue the talks," he told MEPs. Mr Tusk said Mrs May had mentioned the option of extending the transition period planned after Brexit, saying that if it helped reach a deal, "I'm sure that the leaders would be ready to consider it positively". Irish Sinn Fein MEP Lynn Boylan said the UK government was trying to "understate" the issue of the Irish border, and is "yet to understand" a deal cannot be reached without agreement on an Irish backstop. And Spanish MEP Esteban Gonzalez Pons called for an extension of the transition phase to allow time for a second, "definitive", referendum. But former UKIP leader Nigel Farage blamed the UK civil service for the delays in reaching a deal, saying senior officials were "out to sabotage Brexit".